Engineers Week 2019. Dr Peter rEDMOND AND THE 5TH YEAR ENGINEERING CLASS SHORTLY AFTER THE COMPLETION OF THEIR ‘rOBOTICS mASTER cLASS’. 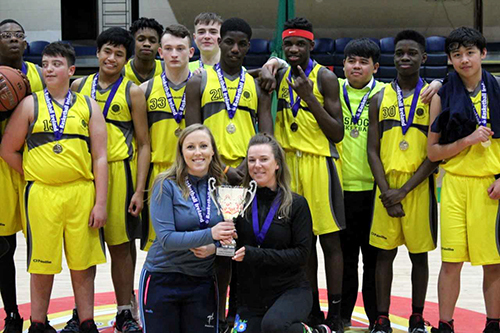 bASKETBALL nATIONAL cHAMPIONS 2019. The team included Bradi Lugemba (Captain), Aaron Venas, Kent Torrecampo, Tyrese Hans, Fabio Francisco, Ayo Ajayi, Irlann Jo Silva, Osborn Osayande, Kurt Larcena, Raul Padure, Kyal Reid, Mao Charles Okoro, Sam Colclough, Isaac Nwosa, Ralph Delos Reyes. Coaches, Aine Dooley and Úna Thorton. Congratulations to the 2nd Year girls basketball team who defeated Mount Anville in the Division C Leinster Finals on Friday. It proved to be a very changeling match however Kishoge managed to succeed over Mount Anville in the end. Let's wish them luck in the All Ireland Finals in two weeks time. Congratulations to their coaches Rachel Haverty and Mary Geoghan. Students are encouraged to engage in all aspects of school life at Kishoge Community College. In line with student interests, opportunities such as talent shows, drama and musical productions, ciorcal comhrá, and debating are offered as well as academic competitions such as the B.T. Young Scientist and SciFest events. Sporting activities are well supported, with students encouraged to participate fully in a variety of sports, indoor and outdoor, team and individual.